It’s hard to tell if this shirt is black or brown, but I’m going for brown. It has lighter brown buttons, and two breast pockets that are cinched a little at the top. 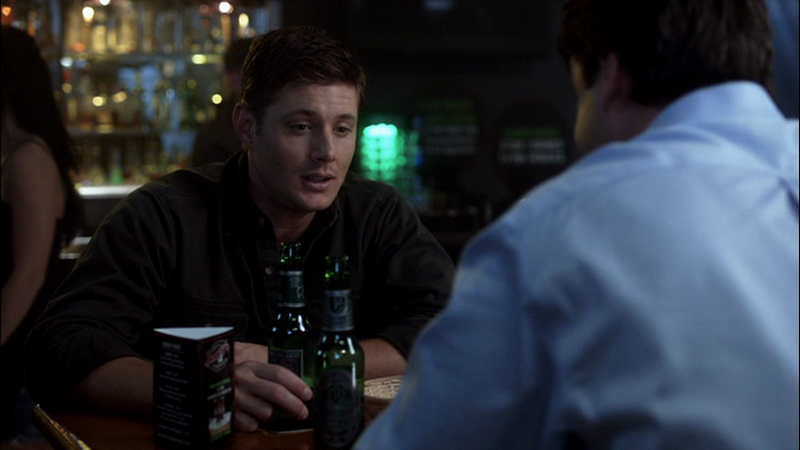 In Exile on Main St. (6x01), Dean wears this shirt from when he goes out to the bar with Sid until he eventually joins Lisa in bed that night. Another one of his domesticated shirts that I really love. I bet Lisa has a nice closet of shirts that she can sleep in or wear casually around the house. Being careful not to stain them, though, so that she won't have to wash it. Because if she were to wash it that would mean she would be washing away Dean's scent as well, and you just can't have that, right??? It looks brown to me, as well. It does make me wonder what happened to all the stuff that Dean left behind.